Data released in recent weeks depicted a mixed scenario for the Brazilian economy at the end of 2018. Inflation data came in better than expected, but negative surprises prevailed on the economic activity front, with industrial activity slowing down meaningfully late last year. That lower-than-expected inflation added a favourable inertial component to near-term price dynamics, which is also benefiting from lower energy prices. This, together with fully-anchored inflation expectations, all but eliminated the risk of a hawkish monetary policy shift by the central bank during 1H19, which helps support medium-term prospects for economic activity. We expect inflation to end 2019 in line with 2018’s 3.75%, marking the third year that inflation undershoots the target by a significant margin. That target is scheduled to drop by 25 basis points (bp) yearly, from last year’s 4.5%, until at least 2021, when it’s set for 3.75%. The 2022 target will be set by mid-year. In terms of economic activity, the recovery has lost some momentum, probably reflecting heightened caution amid the political uncertainties that prevailed during 2H18. Labour market indicators continue to improve, but at a very subdued pace, keeping unemployment rate exceedingly high (12%), almost double the levels prevailing before the 2015-16 recession, with job gains especially concentrated in the informal sector. There has also been a marked distinction between consumer and corporate indicators. This is partly explained by Argentina’s recession, which hurt manufacturing exports, and by domestic sentiment indicators, which showed a more favourable reaction by consumers than producers to last year’s electoral cycle, boosting retail sales, for instance, but hurting capital investment activities. The activity outlook for 2019 remains constructive, despite the disappointing prints in 4Q18. 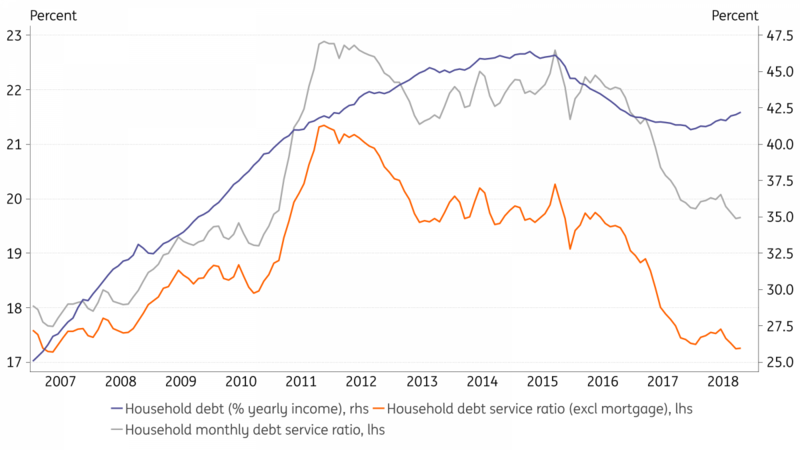 Business sentiment should gradually catch-up to consumer sentiment, while continued monetary stimulus suggests a strong potential for a recovery in the credit cycle, aided by low indebtedness by households/corporates, following the sharp de-leveraging that took place over the past three years (as seen in the chart below), the lower delinquency levels, and low rates. Private sector bank lending is already surging, growing at double-digits for the first time in more than 6 years, while public-owned banks continue to contract their lending portfolio, adjusting to the excesses of the PT administrations. Our forecast is that GDP expanded 1.2% in 2018, with 2019 set initially at 2.7%. Failure to approve the social security reform by 3Q19 would revive prospects for a monetary tightening, as local assets, notably the BRL would weaken. Alternatively, if the fiscal reforms advance in Congress, local markets could start testing the case that the SELIC rate could be cut, as the debate over what’s the neutral level for the policy rate would likely intensify. 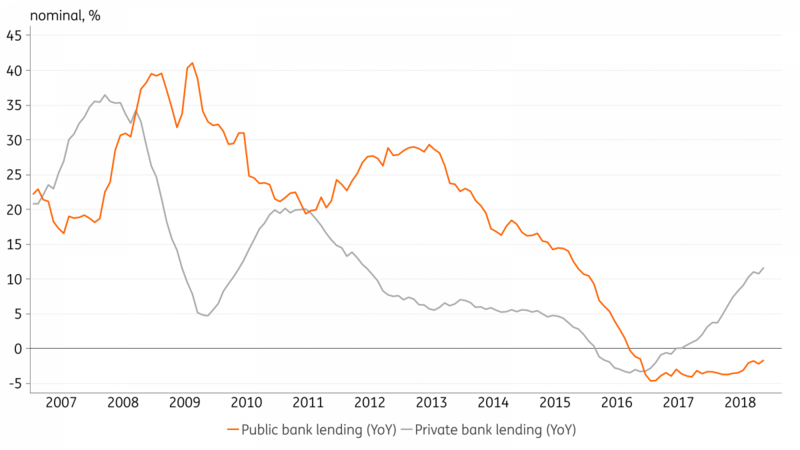 Reasons for the neutral rate to have fallen include structural changes in credit markets, notably the extended contraction in lending by public sector banks, as seen in the chart below, and the end of the implied subsidies included in the BNDES benchmark lending rate. the new fiscal framework, centred by the fiscal spending ceiling, which lends a forceful tightening bias to fiscal policy in the foreseeable future. Other factors that should contribute to lower estimates for Brazil’s neutral policy rate include the consolidation of the credibility in the inflation-targeting regime, the planned 75bp drop in the inflation target by 2021, the change in the minimum wage adjustment rule, which should be approved by Congress by April, and the new fiscal framework, centred by the fiscal spending ceiling, which lends a forceful tightening bias to fiscal policy in the foreseeable future. On the political front, the good news is that Bolsonaro appears inclined to support the social security reform draft introduced to Congress by former President Temer, using amendments to alter the proposal. This should expedite the approval process substantively, as that proposal has already gone through all the preliminary procedures (ie, approvals at committee levels) and is ready for a vote by the entire Lower House. As such, the reform could be voted by the Lower House as early as March. Once approved by the Lower House, the reform must then be approved by the Senate, which could take another 3-4 months. This reform, a constitutional amendment, requires a qualified 60% majority for approval in each congressional chamber. Bolsonaro’s official party base is estimated to include slightly more than 50% of Congress, therefore substantive uncertainties remain as savvy political negotiations will be critical to ensure the reform’s approval. The administration has yet to announce its final reform proposal. Some of the key questions involve the minimum age for retirement, how quickly the transition to the new regime will take place and how much convergence will there be between the regime available to the private sector and the special regimes such as the one available for public sector workers, the military, the police, and teachers. A faster transition rule seems especially important, to us, to re-anchor fiscal accounts in a timely fashion. The new Congress will be inaugurated early in February when initial investor focus will be on the election of the new leadership for the Lower House and the Senate. Electing allies to preside over each chamber is crucial to ensure a smooth legislative progress for the administration’s priorities. In particular, the re-election of Rodrigo Maia as Lower House President would be seen as a positive development. Uncertainty about reform passage is bound to create episodes of volatility in local financial markets, but we still expect the reform to be approved. The sooner the reform is voted on, the higher its likelihood of success, and the bigger the payoff in terms of activity recovery in 2019. Its eventual passage should trigger a temporary overshooting in the BRL, towards the 3.3-3.5 range, relative to fair-value in the 3.6-3.7 range. Failure to approve the reform would, meanwhile, trigger a sell-off towards 4.0.